It is a model by Yoraish and you can read more about this "Little Boy", at his blog. 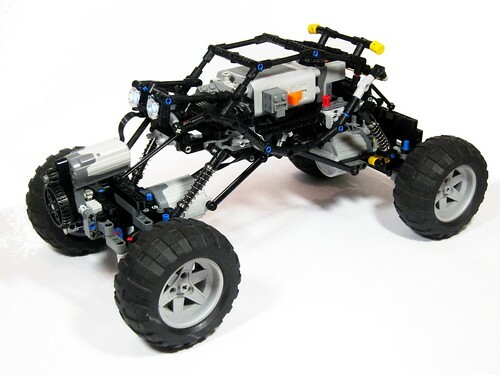 Chassis for a rock crawler must be dead simple and lightweight. So it is this one, and it has a four link suspension off course. The end result seems to be at his optimal speed. It isn’t too slow and boring and not too fast - it doesn’t slip off obstacles because of its speed. You may also download LDD building instructions here, but watch the corrections video to complete the model properly. Additional pictures for this crawler, from Yoraish's photostream at flickr. No obstacle too tough for it! There's a PDF Parts List for this available on SkyDrive: https://skydrive.live.com/redir.aspx?cid=5641cce2a1cc0886&resid=5641CCE2A1CC0886!201&parid=5641CCE2A1CC0886!200 . I built it just yesterday, and found that the suspension collapses easily under strong front/back force (such as climbing a vertical obstacle). This might be improved by adding a second receiver and controlling the drive motors independently. Also, if you use stiffer springs the spring mounts must be modified to hold them more firmly. I had to modify it to use 6L links because I didn't have enough 9L ones, which may have weakened the suspension. Wow. Why not just buy a competition grade brushless r.c crawler? Lego rc is a waste of money.